Made You Look was the top juvenile on turf at Saratoga last year and he resumed a first-time winner as a three year-old in Florida on Saturday. The good-looking More Than Ready colt comfortably took the Group 3 Dania Beach Stakes (1500m) under Javier Castellano at Gulfstream Park. 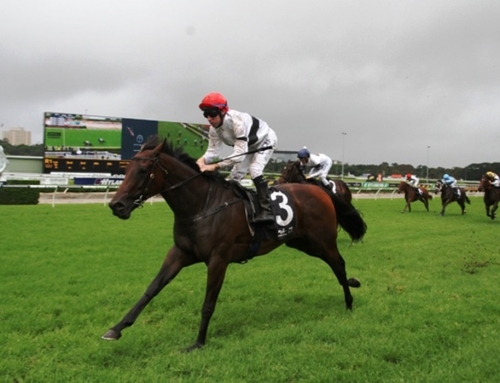 He seized control just before the furlong marker and drew off to win by more than two lengths. Made You Look (3c More Than Ready – Night and Day by Unbridled’s Song) is from a daughter of 1995 Eclipse Award filly Serena’s Song and cost part-owners Bryan Sullivan and Kevin Scatuorchio $360,000 at the 2015 Keeneland September yearling sale. Prepared by More Than Ready’s trainer Todd Pletcher, he had won a Belmont Park maiden in June 2016 prior to a Group 2 victory in the With Anticipation Stakes at Saratoga. That earned a start in the G1 Breeders’ Cup Juvenile Turf, however, he was dealt a wide trip and failed to fire at Santa Anita in November. “He had trained really well but only ran an even race,” Pletcher recalled. “I was a little disappointed although it wasn’t a horrible effort. More Than Ready has 30 yearlings selling at the Gold Coast Magic Millions commencing on Wednesday including a half-dozen from Vinery.